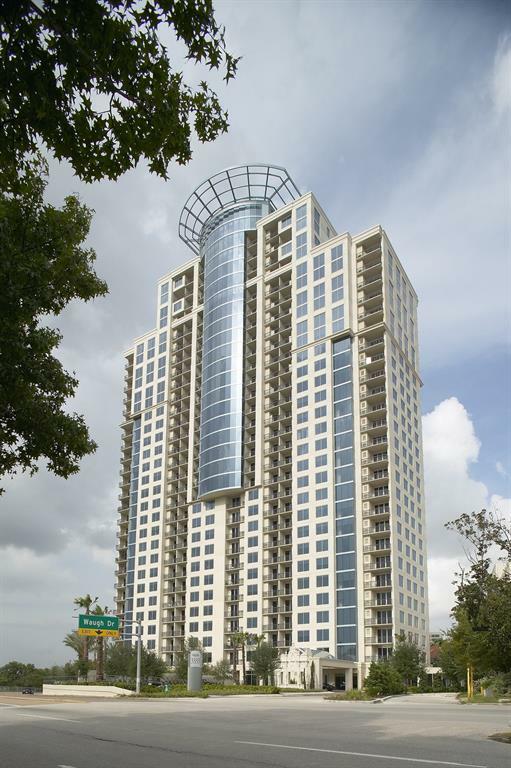 The Royalton at River Oaks is a majestic 32 stories boasting the best panoramic views of Houston. Luxury amenities include concierge with couriers, valet, weekend limo service, night security, sparkling infinity pool with jacuzzi, state-of-the-art fitness center, private wine room and peaceful gardens. There is a Ball Room for parties, Crown Room for intimate dinners and Club Room with a Theater. Designer guest suites are also available. Pets have access to a private off-leash green space. Offering a unique lifestyle and prime real estate opportunity, this 2-bedroom, 2-bathroom corner unit has breathtaking views of the Houston Skyline and Buffalo Bayou. Upgrades include hardwood floors and conversion of the master bedroom into extended living space. The stunning arched doorway with glass sliding doors offers flexibility to this exceptional home. Features include stainless steel appliances, granite countertops and a custom entertainment center with fireplace for added ambience.